Last week I posted about how nearly all my toys had to be thrown out because moths had eaten them. For months, I've been chasing the mature moths for the peeps but we didn't know the nest was in my toy baskets until last week. After reading my post, some of my BFFs offered to send me care packages. The first package arrived on Monday, from a great Twitter furrend @Pumpkinpuddy and her sibs EK and Candy. 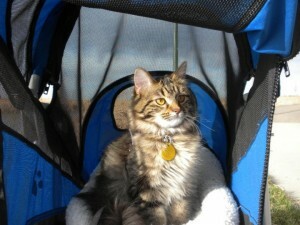 They also have a wonderful blog, Adventures of a Suburban Kitty. If you don't know her, stop by and give her a shout out. The package was pawsome! It contained a nip nanna, a kickaroo, some little silver fishies, a couple of brand-new Kong toys, and even one of her Toki Poki cards! Many, many thanks to Pumpkinpuddy and her Mom for putting my package together. My new toy basket no longer looks empty. The loot in my care package from Pumpkinpuddy. TW took a few videos of me smelling the package and the kickaroo. She didn't give me all the toys so as not to overwhelm me cos then I wouldn't know which one to play with. The biggest hit was the little fishies. TW threw them down the hall and I was a blur as I raced after them. This was a fun game that ended much too early. TW says I went to the window and lost interest; I say it was HER who abandoned me. Then I had my way with the nip nana. There are no pictures to document it. Anyway, thanks to Pumpkin, I now have some cool toys. You're the bestest! A note about the moths: I've been chasing them for over a year, but the peeps couldn't see them with their old senile eyes. Instead they chose to make fun of me; even excusing me of having "floaters" in my eyes. "Oh look, she must be chasing those imaginary floaters again! Haha!" Then they said I was in "MoMo-land", wherever that it. Well, it might've cost me my entire toy basket, but I got the last laugh! HAH! Now when the peeps see my chasing something or staring intently at the floor, they pay attention. You have the last and the best laff girl friend! That'll show 'em! Pumpkin Puddy is the sweetest of furriends sending you all of those toys. I love my nip nanner too. Mommy has yet to get me a kickaroo though. Maybe I show my sad face? Wow, what great friends you have and so nice of @Pumpkinpuddy to send you toys! Enjoy! Nice one , at least you aren't toyless anymore. Keep them moth free now. Heh. I can't believe your humans thought you were chasing after imaginary things! You showed them. Oh that is so exciting that you got all those toys. What a good friend that Pumpkin is for sure. WE will go visit them. They sound like good peeps and kitties. Take care and have such a good time with all those toys. You got some pretty cool toys there, CK! Maybe it was worth those moths and having all your toys thrown away! Wow what a ton of toys! We may let the moths have at ours to get new ones! That is so great CK and I know how much you will be enjoying moth-free toys! Woo Hoo CK! High Paw Slaps furrlfurriend!! Ya taught the peeps to take notice of you and your actinos...cats totally rule...enjoy those well deserved new toys...and, errr, ummm...if ya have any ya don't want...send them along to me for the guys over at my former shelter...no pressure...just wanna let ya know...Enjoy the moment CK! Does this mean that Mommie will start paying attention whenever I stare blankly at the wall for long minutes at a time? Oh CK! Whenever there's video of you, I have to periodically avert my eyes lest I get too fainty from gazing upon gloriousness! You were so excitingly slow and deliberate in your movements today too--I could watch each little muscle ripple under that dense and delicious fur. I need to watch again pretty soon but The Human says I need a little break first. Just look at that lovely nip nanner! It looks so lushious! Ours got eaten by our hairy sister Cinnamon. Me can't wait for her to gets a little older so wes can has toys again. And me is happy yous gots the peeps trained to pay attentions! What is this MoMo land you speak of??? Those furiends were sure awesome for sending you such cool stuff!!! I'm working on swiping some BlogPaws swag for you!!! Yes we are able to see things like floaters that are much too small for the peeps eyes. Though you lost your toys you gained much more respect and got some nifty new toys out of it. Good going CK you can teach so much. How sad that it took the loss of your toys to teach your humans a lesson. At least now they know, and you gots all new toysies! We think Pumpkin is pawesome too!! I hear floofy-CK got to meet her at BlogPaws?